Flux is a full service event production company. We offer a one-stop service for clients from concept to completion. We charge a flat fee and operate transparent budgets. 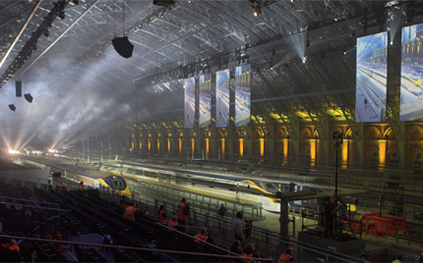 Production: Flux delivered all production elements of the Royal Gala opening of this new international transport hub. It involved a forty day build with 2,000 tonnes of equipment for three days of events with visits by three heads of state and 9,000 guests. "This station cost £800 million. It needed a grand opening. Flux gave it just that. " 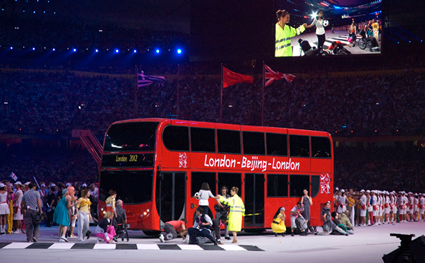 Role: Flux produced the “Big Red Bus” sequence that drove into the Birds Nest Stadium and opened to reveal Jimmy Page, Leona Lewis and David Beckham at the 2008 Beijing Olympic Games and launched London’s 2012 Olympic success. "The obstacles to success were enormous while the whole world watched. Flux delivered total success with cool professionalism."